Uncategorized Archives | Whitby Garage Doors Ltd.
How many things have you done to make your home and garage more environmentally friendly? Probably more than you think to your home. That’s because the added bonus of changes to make your home ‘greener’ is that you also save money in energy costs and fewer maintenance and repair costs for your heating and air conditioning equipment. But most homeowners don’t take similar steps to make their garages more environmentally firendly and energy efficient. In a way, that’s odd because garages can be among the biggest sources of energy waste in the home. While they can be as cold as it is outside in the winter, and as hot as it is outside in the summer, the idea that garages are ‘inside’ means many of us don’t take the same steps to make them more energy efficient as we do elsewhere in the house. But making your garage more environmentally friendly helps make your entire house more energy efficient too. Here are just a few things you can do to have a more environmentally friendly garage. By switching the lights in your garage to CFLs and LEDs, not only will you reduce your electricity use and costs, your garage will probably be better lit than it was using incandescent and neon lighting. Especially for garage walls and ceilings that are shared with the home, insulating them will reduce your energy costs and make your home more comfortable too. Even if the rest of your garage is well insulated, an uninsulated door wastes a lot of energy and lets more heat and cold get into your house. Your garage door opener might work really well, but that doesn’t mean its working efficiently. If there is anything interfering with the easy opening and closing of the door, like sticking rollers or being out of balance, your door opener can be using extra energy every time it operates. Regularly check that your door opens and closes easily by disconnecting the opener and operating the door manually. If you want more tips to save money by making your garage more environmentally friendly, give us a call here at Whitby Garage Door. If you’re the type of homeowner who doesn’t renovate or redecorate as often as others, it’s might not be for lack of desire. Many people have a difficult time deciding on a direction for their renovation/redecoration projects, or even knowing what’s possible, and they end up putting it off until some sort of inspiration strikes them. One of he problems is that many of the places we look for ideas, like architectural magazines and websites, don’t always show homes like the ones we live in. That makes it difficult to know if and/or how the idea will work in our home. And, in the case of something like a garage door, there doesn’t seem to be anywhere to find lots of great ideas, other than a manufacturer’s website – and, of course, all the doors there will look fantastic. But fear not. Here are three places on the web where you can find virtually endless images of garage doors, openers, interiors, floors, storage, etc., (and of any other room in your home), many of them from real homes just like yours. If you haven’t heard of Houzz, it’s designed to give you ideas and inspiration for interior home design and renovations. Without over 15,000,000 images online, you’re bound to find more than a few ideas for your garage. If you want to find images of anything, including garage doors Pinterest is the place. And you’ll also find images and links for just about everything to do with your garage, from door hardware to storage ideas. This is the place to find garage door ideas that are most suitable for your home. How so? Because you can use it to check out real estate listings here in Whitby, right in your neighborhood, where you’re more likely to find homes of a similar style to yours. When you’re ready to install your new garage door (or you still need more ideas) get in touch with us here at Whitby Garage Doors, we’re ready to help. Have you ever wondered, when you visit someone’s house, how the heck they keep it so neat and tidy? And we don’t mean people who invited you over. There are those who, even when you drop in unannounced, have a home that’s neater than when you just finish your cleaning. Sure, they might be really well-organized people with a place for everything and everything in its place. But if you want to see the truly organized anyone is, check their garage. Chances are, even your ‘neat freak’ friends, have a garage that looks much the same as your on the inside. So here’s your chance to ‘one-up’ friends and family whose homes always seem so neat, organized and ‘together’. While you have closets, shelves and cupboards elsewhere in your home, your garage usually has none them. Yet it’s still expected to house everything from your car and sports equipment, to lawn furniture and tools. Here are just a few storage ideas to have a place for anything and everything you store in your garage. Collectively known as enclosed storage, this is probably the type of storage that garages miss the most. Enclosed storage gives you a place to keep things out of sight and/or securely locked away. On the other end of the spectrum, if you do already have some ‘storage infrastructure’ in your garage, it’s probably open shelving. There will always be those things you just want to have quick access to and they don’t need to be locked away. Using slotted walls adds lots of versatility to your storage by giving you the option to keep things in the baskets, hooks and shelves that can be slotted into the wall. The most under-utilized space in the garage is just above your head. Especially if you don’t have a room over the garage, you could have space for some of the largest items in your garage. From building a large shelf and making a mini attic, to storing building materials, bikes and tires, the overhead space in your garage can be used to store some of the largest, space-hogging things you have. Once you get your garage organized, you’re ready to take the next steps, including an insulated garage door, to completely revamp the space. And then you’ll really be able to look down your nose at your ‘neat’ neighbours. The good news about buying a new garage door is that you’ll probably not have to do it very often, if ever again. The bad news is that, because you rarely shop for a door, it’s tough to know what to look for. Unlike most other products you buy, not only do you need to choose a door, but you need to hire a garage door installer to put it in for you. Unfortunately, choosing an installer isn’t as easy as it might seem. Some installers know that you don’t buy lots of garage doors and they take advantage of the fact with shoddy workmanship, poorly made doors, or both. To help you avoid being the victim of a ‘fly-by-night’ installer, here are three ways for you to know that the company you choose is reputable and that the garage door they install is from a leading manufacturer. When you start your search for a garage door company, you’ll probably find a few that catch your eye. Once you have a ‘short list’ of possibilities, don’t just check out a company’s website (they do have a website, don’t they?! 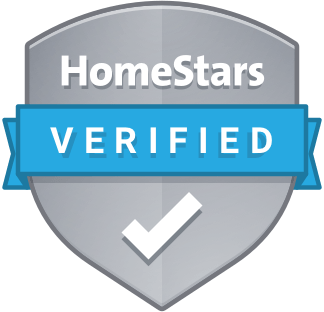 ), but be sure to visit third-party ratings sites, like Homestars and Houzz, where you’ll be able to read what other homeowners have to say about the company. If you call or contact a company who wants to give you a quotation for installing your door without visiting your home, you should probably scratch them from your list. It’s not possible for them to give you an accurate quotation without inspecting your garage to find out how much work they need to do. And when they visit you get the opportunity to learn more about them, get a feel for how they work and make your own judgement about whether they are suitable for the job or not. The company should be able to show you a number of options for doors from different manufacturers. They should also offer other products and services, including garage door openers, replacement parts and emergency repair services. The garage door company you choose is as important as the garage door you choose. Even the best doors will have problems in they aren’t installed properly. It’s March, and you know what that means: it’ll be springtime before the end of the month. Normally that’s casue for a celebration, but when it comes to the asphalt on your driveway, the ravages of winter mean you’ll be faced with a whole new set of cracks, holes and missing asphalt this spring. In winter, especially like the one we’re having this year in Whitby, the fluctuation of temperatures above and below freezing can literally tear at your driveway as the water on its surface and underneath it freezes and thaws. A few cracks and bumps on your driveway is not generally a problem. But at some point they can make your drive way a safety hazard and you don’t always know when that point is reached until it’s too late. If you’re planning to repave your asphalt driveway, maximizing its lifespan begins the moment the work is done. Here are just some of the things you need to do to start your new driveway off on a long life. That is don’t drive over it into your garage, don’t park on it, don’t put your car anywhere on your just-finished driveway. Even in ideal conditions, asphalt takes at least a few days to harden, and an extra one or two days wouldn’t hurt. Asphalt is more pliant under high temperatures. If you happen to repave your driveway during a heatwave, you should avoid using it completely for at least a week, or perhaps until cooler temperatures prevail. During that time, even walking on the driveway can mar its finish and things like patio furniture could even puncture a hole in it. They will pop up in the tightest cracks. To reduce the appearance of grass and weeds on your driveway, install a strip of gravel or topsoil around all the edges of the driveway that run along lawns and/or gardens. A repaved driveway not only makes your home look great, it feels great to use it, so it pays to starting making it last as long as possible as soon as its installed. In your garage door insulated? Chances are that you don’t know the answer. So you wouldn’t know the type or R-value of the insulation either, and you probably don’t care. But you should. An insulated garage door offers many of the same benefits as your home’s regular insulation, and a few more. First, R-value is the measure of how well any insulation prevents the transit of heat from one side of the insulation to the other. The higher the R-value, the better the insulation. There are lots of reasons for you to pay more attention to your garage door’s insulation and it’s R-value. Just like your regular home insulation, the stuff in your garage door prevents heat from getting out in the winter and prevents it from getting in during the summer. It doesn’t matter that you don’t heat or air condition you garage. The heated and cooled air from your home gets into your garage. Without an insulated door, that expensively heated or cooled air is lost much faster. Many of the things you keep in your garage, like a lawn mower, can suffer from exposure to freezing temperatures. But even worse than temperature extremes, the fluctuation from cool to warm temperatures, like in the spring and fall when nights can be quite cool, but the days much warmer, can be even worse. That relatively quick shift from cool to warm can cause condensation on the objects in your garage. Condensation that could cause metal objects, again like your lawn mower, to rust or mold to grow just about anywhere. The two main types of garage door insulation are polystyrene foam and polyurethane foam. Polystyrene comes in sheets (you might call it Styrofoam) and, even when it is well fitted to your garage door panels, it can’t get into every space and crack, leaving areas that might be almost fully exposed to outside air. Polyurethane foam is sprayed on and it expands to fill every gap. But no matter which type of insulation you have, if the gaps between the door panels and around the outside of the door aren’t properly sealed, then air can get out and in with nothing in its way. That means you could have a certain R-value for your insulation, but that wouldn’t be the effective R-value of the overall door. From making it easier for your car to start in winter, to reducing the noise in your garage all the time, there are many other benefits to an insulated garage door. So the next time you look at your door, or are in the market for a new one, make sure it’s well insulated and well-sealed. In addition to warmer temperatures and blooming flowers, spring is also the season for garage sales. Not only do garage sales give you a way to get rid of all the stuff you find in your spring cleaning, but they are also a great way to reconnect with neighbors, get all the family involved and make a bit of money (for your favorite charity?) at the same time. Even if it’s still a little cold outside, the sooner you start planning your garage sale, the more successful, and easier, it will be. Here are just a few things to consider for your plan. This might sound obvious, but if you don’t set a solid date right away, other plans can pop up to occupy all the best dates and you end up postponing the sale for yet another year. Garage sale shoppers like to find a neighborhood that has a number of sales so they can look through more bargains in one place. Talk to your neighbors and let them know about your plans. Chances are they have a lot of stuff they want to get rid of too. You’ve probably been coming across things all winter that you’d like to make part of a sale. But if you leave it to the last minute to get them together, you’re not going to find half of them. Set aside space in your home or garage to collect stuff as you come across it or think about it. Now’s the time to start planning your ‘promotional campaign’ too. Start looking for and making note of all the local publications and websites you can use to tell everyone about the sale. If you use social media, don’t be shy about telling all your connections too. Check the garage sales/auctions page on the Durham Region website. You’d be surprised at how much traffic that signs around the neighborhood and community will attract to your sale, even on the day of the sale. Start designing and creating them now. One more thing to plan on doing for your garage sale: have lots of fun!